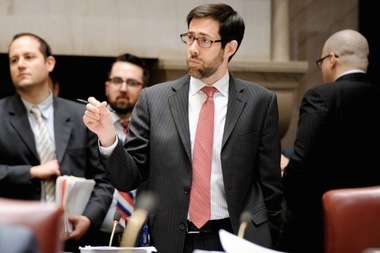 State Sen. Daniel Squadron announced his resignation Wednesday morning. NEW YORK CITY — State Sen. Daniel Squadron announced Wednesday he will resign from his post this Friday to address threats to democracy nationwide. Squadron will vacate his seat in the 26th District — which covers Lower Manhattan and parts of Brooklyn — ahead of this November's election to pursue an upcoming unspecified project to enact better policies and curb corruption. Squadron shared the announcement on his website Wednesday morning, in addition to penning an op-ed in the New York Daily News that lamented the influence of corruption and "a sliver of heavily invested special interests" that he says hampered progress in the state Legislature. He will focus on addressing corruption beyond the state level, fearing the influence of major political donors the Koch brothers amid rumblings they may begin to invest in President Trump's agenda, he wrote. Squadron added that he will be launching an initiative in response. "There are no easy answers, but I believe stronger candidates, a sharpened approach and better policies at the state level can help turn the tide nationally," he wrote in the op-ed. "In the coming months, along with entrepreneur Adam Pritzker and Jeffrey Sachs of Columbia University, I will launch a national effort focused on addressing this crisis — joining others already doing important work toward 2018 and beyond. "It is not possible to devote myself to this goal and serve my constituents at the level they deserve. For this reason, I am announcing my resignation from the state Senate." Squadron added that his Senate seat would be filled in this November's election.